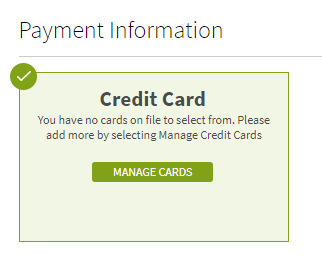 Click Save New Card. Click Save New Card. At this point you may encounter a ReCAPTCHA. Please follow the ReCAPTCHA directions to select particular photos from the set of photos provided (for example, you may be asked to select all photos that include street signs, or all that include trees). Please note: When adding or editing your credit card information we will perform a pre-authorization of $1 to validate your card. For more information please visit our article: Why do you preauthorize my credit card for $1 when I add/update my card information?